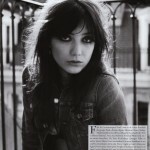 Daisy Lowe in “Lazy Daisy” from Patrick Fraser on Vimeo. Shot on location in Paris for BLAST magazine, Daisy Lowe is featured in this fashion shoot and video captured by Patrick Fraser. In this simple spread styled by Celine Marioni, with hair by Jean-Luc Amarin and makeup by Tiina Roivainen, Daisy models with rocked-up bed hair, dark eyemakeup dressed (for the most part) in a Jacket & Jeans by Levi’s.